With the evolution of digital banking, newer tools and technologies are being adopted every minute to enhance customer experience. According to a report by IDC, worldwide spending on cognitive and artificial intelligence (AI) systems went up by 54.2% from 2017 to 2018 to an estimated $19.1 billion. The figure is predicted to grow to $52.2 billion by 2021. Breaking company silos: Banks are notorious for operating in silos, with every service/product being handled by different departments. The silos prevent effective inter-departmental communication and also sharing of key data insights that could be used to improve customer experience. Recommendation: Forming cross-functional teams with shared responsibilities to create a unified multi-channel approach. Some banks have a centralized CX team that handles several enterprise-wide initiatives. 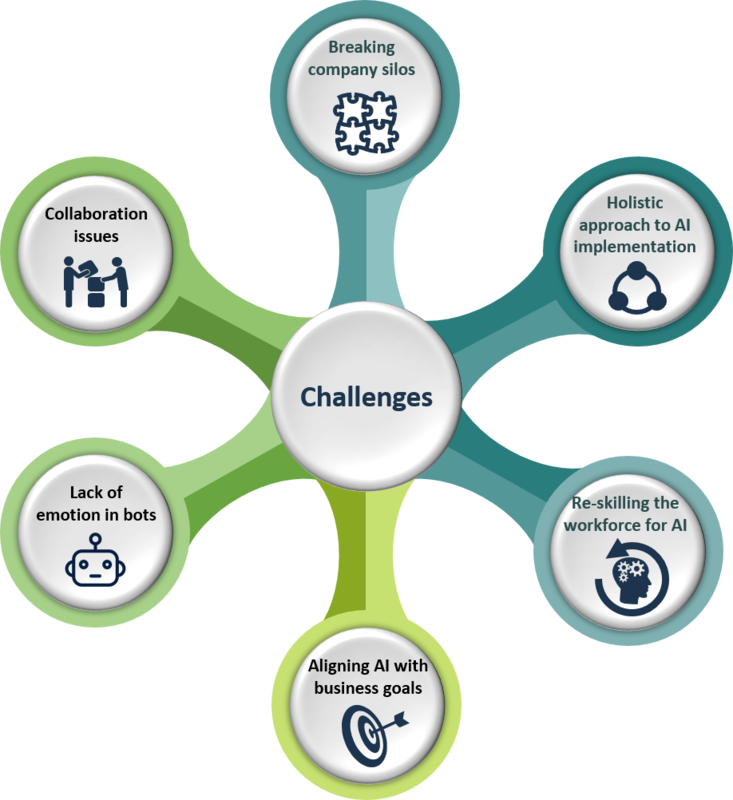 Holistic approach to AI implementation: While banks explore chatbots and virtual assistants to take over a small portion of their business, they fail to leverage AI into the entire banking ecosystem. For effective AI operation, banks need to integrate data points, invest in cloud technology and enable a secure network to support its implementation. Recommendation: Banks are investing heavily in AI-driven applications that are transforming how customers engage across the financial sector. Re-skilling the workforce for AI: Most banks train their workforce based on their assigned department. Mix in intelligent technologies, such as AI and blockchain, and employees are left with a skill gap that can’t keep up with the evolving technology. As per a report by Accenture, banking CXOs believe that only 1 in 4 employees are ready to work with intelligent technologies. Only 3% of these banks are planning on increasing their investment in reskilling their workforce. Recommendation: Reimagine work to understand human-machine interaction, create new roles or redeploy your workforce based on their skills, and encourage talent development with increase in transformation investment. Aligning AI with business goals: Datasets are the backbone of AI operations. To be able to derive prediction with high accuracy, companies need to define their datasets. This is possible when a company is able to strategize and define clear business goals or mission statements. AI alignment helps in delivering accurate information to businesses, creating a transparent operation model with defined outcomes. Companies have to focus on aligning business, digital and AI strategies to prioritize digital transformation initiatives. Recommendation: Develop a clear strategy to link data sources for accurate AI operation of data mining and analytics. A dedicated group of business and technology leaders would aide in developing strategic business measures and also monitoring platform performance based on set goals. Lack of emotion in bots: Although banks have implemented chatbots, many customers feel the lack of emotional intelligence that can only be provided through human interaction. Recommendation: Invest in sentimental analysis to understand customer response and sentiments. The analysis would help in improving customer engagement and receiving real-time customer feedback on products and services. Collaboration issues: As the financial sector deals with a complex web of transactions, it’s important to implement fail-safe mechanisms. Multiple AI systems are deployed to handle specialized tasks, fitting into a streamlined process. Recommendation: Develop AI-enhanced cognitive collaboration tools that have built-in expert systems. These systems would have their own knowledge base to deal with complex issues in a particular domain. Despite its challenges, one can’t deny that AI is here to stay and will continue to significantly affect the banking sector. Its rewards of efficient systems, cost reduction and improved customer experience outweigh the risks of implementation. Moving forward, AI is going to play a key role, forming the digital backbone of banks. This would require a change in organizational structure, business models and customer acquisition and retention.